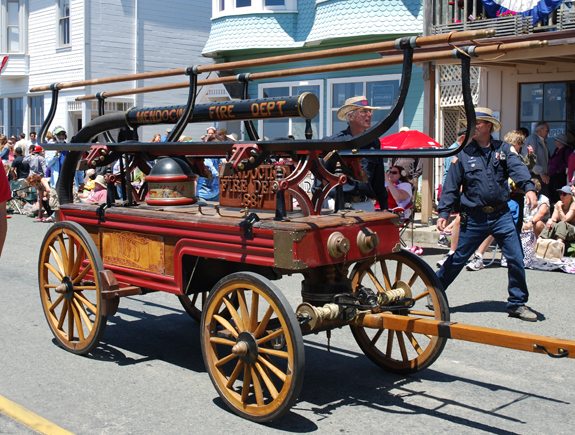 2012 is the Mendocino Volunteer Fire Department’s 125th anniversary. A lot has changed since its founding in 1887, but one thing remains the same: the Fire Department’s success depends on the support and participation of the community. 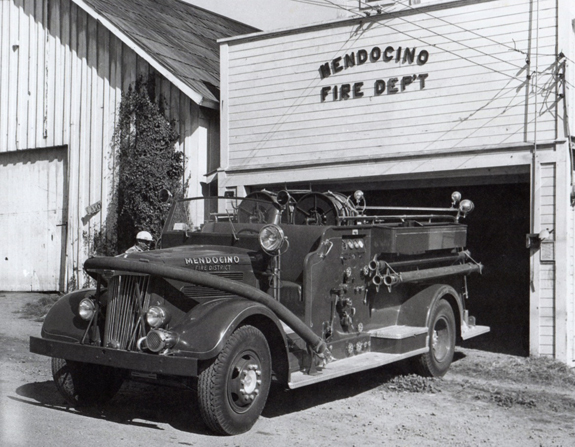 The Mendocino Volunteer Fire Department was founded in 1887. The members of the executive committee created to form the Department are familiar names from Mendocino’s early history: William Kelly, Eugene Brown, Jerome C. Ford, William Heeser, Henry H. Jarvis, John D. Murray, and Jack Frodsham. Twenty-eight men joined the charter company, including some of the town’s most prominent businessmen. Soon after its founding, the Department began acquiring and building infrastructure for firefighting. Water cisterns were excavated around town, and a fire station built on the south side of Main Street, across the street from the Mendocino Hotel (then named the Central Hotel). The station’s bell tower housed a 700-pound bell for signaling fires. The bell, replaced by a siren in 1922, is now displayed outside Station 841, on Lansing Street. One of the Department’s other early acquisitions was its first fire engine, a hand pumper purchased for $1,835. Although it might seem primitive by today’s standards, it produced a stream of water strong enough to tear the shingles off buildings. Last used to battle a fire in the 1920s, the hand pumper was the centerpiece of the 2012 Fourth of July Parade, and is regularly demonstrated at the Department’s annual open house in October. Through the first half of the twentieth century, the Department had both advances and retreats. The town already had fire hydrants served by water towers as early as 1888. But by the early twentieth century, the system had expanded to include a 20,000-gallon tank, 12 hydrants, and 3,500 feet of pipe along Kasten, Covelo, Calpella and Main Streets. But over this same period, the Department periodically faced shortages of money and manpower. There were lumber mill closings, and the Great Depression. 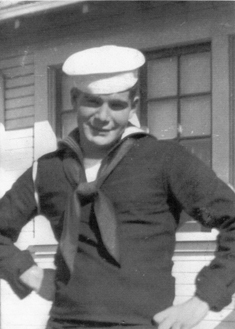 But World War II dealt the biggest blow, with the majority of the town’s younger men going off to war. A young Navy sailor returning from the war was destined to rebuild the Mendocino Volunteer Fire Department. 22-year-old Eugene “Foggy” Gomes was a Mendocino native whose father was a volunteer firefighter. He had gained firefighting experience during the war, so then-chief Dr. Russell Preston asked Foggy to take a look at the Department’s equipment. Foggy found two trucks, both with flat tires and no gas. He got the trucks running, prompting Dr. Preston to appoint him as the new fire chief. Foggy Gomes served as chief for the next 53 years, and under his leadership, MVFD grew into a modern fire department. A keen judge of character and a natural leader, Chief Gomes was instrumental in keeping the volunteers motivated. He also excelled at fabricating firefighting equipment from inexpensive used vehicles, like the Department’s first tanker truck, made from an old Chevy truck chassis. A few years after Foggy Gomes became Chief, the citizens of Mendocino began working to create a fire protection district to provide the Department with greater financial resources. Over one hundred residents submitted a petition to the County, and after a public hearing in March 1948, the Board of Supervisors unanimously voted to create the district. The "White," in its original glory in 1948. Under the leadership of Chief Gomes, and with the backing of the newly created fire district, the department grew. In 1948, largely from donations, the Department acquired its first new fire engine since purchasing the hand pumper in the previous century. The new engine, referred to as “The White,” cost $13,689, and carried 500 gallons of water. Still in service today, the White is a favorite at the annual open house, giving children of all ages rides throughout town. Chief Gomes took a department that was on the edge of collapse at the end of World War II, and built it into a modern fire department. The residents of Mendocino owe Chief Gomes a debt of gratitude for the Department that exists today. 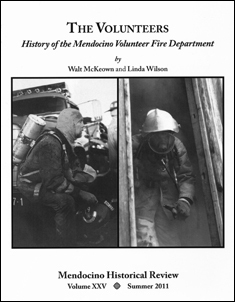 Those interested in learning more about the Department’s history should read The Volunteers: History of the Mendocino Volunteer Fire Department, by Walt McKeown and Linda Wilson, published in 2011. The book may be purchased at the Kelley House Museum, and was the primary source for the portions of this article on the Department’s history. Also available is a DVD video of a program presented in conjunction with the publication of the book in 2011.